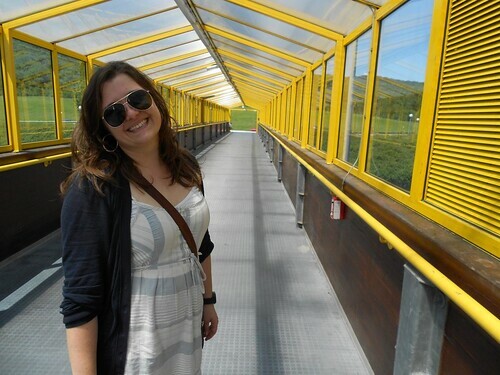 At this time last year we were at the beginning of our amazing Swiss vacation. It strikes us particularly hard today knowing that it will likely be a long time before we ever have a vacation like that again. We made the most of today by watching the beginning of the Tour de France, going for a scenic drive (so that Jen could see some sights and still mostly follow the rules of her bed rest), and dining outside. Each time we have a dinner outside we appreciate that it may be our last for some time. Yesterday I left work early after Jen had to take an unexpected trip to the hospital for more monitoring. This is so routine now that neither of us really voiced any concerns about it at the time. After her monitoring where everything was determined to be fine (once again) we ended up just ordering take out burgers and scarfing them down before watching a few episodes of Eureka and going to bed. Tonight, however, we made the most of what could be one of our last outdoor dining experiences as a childless couple. 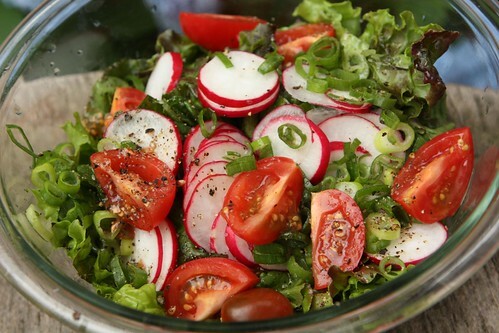 I started by making this salad with red leaf lettuce from the farm, sliced radishes, tomato, and green onion with a little olive oil, salt, and pepper. After our drive this afternoon I stopped by the local butcher shop and found these veal sausages, very similar to the many veal sausages we had during our stay in Switzerland last summer. 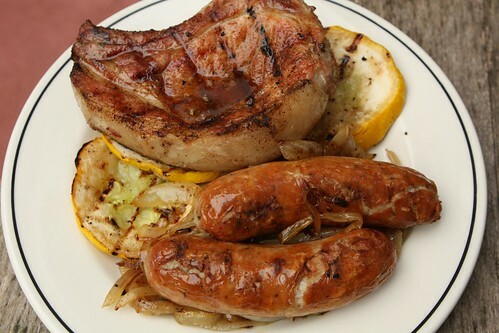 I grilled them up and served them with a nice grilled Berkshire pork loin chop, caramelized onion, and grilled summer squash from the farm. 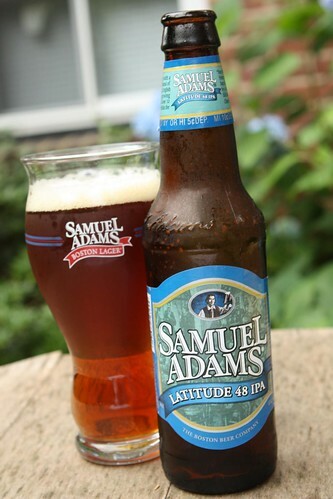 For beer I chose this Latitude 48 IPA from Sam Adams. It's made with German hops which sort of goes with the veal sausage/Swiss theme so I thought it would be appropriate. It was a very nice, slightly malty, IPA, another from the Sam Adams Hopology variety pack. Sam Adams, I never gave you the credit you deserved until very recently. By the way, I'm loving drinking beer out of this amazing glass. I don't know what it is. It could just be that I love a novelty glass. Jen is at thirty-five weeks now which means the guys could be here any day now. She looks a bit different than she did a year ago. However, she probably feels more comfortable today. Don't let that picture fool you. That was the most miserably hot highway overpass on planet Earth. 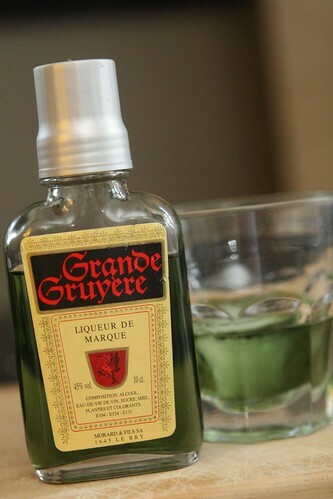 To round out the evening I poured myself a little of this Grande Gruyère Liqueur de Marque that I got on our trip to Gruyère last year. It was actually far better (and less medicinal) than I'd been expecting. It made it totally worth the experience of dealing with the wretched French shopkeeper in town. Now it's time for a little culture and a viewing of National Lampoon's European Vacation to complete the European experience before calling it a day. Here's hoping! Although lately the Greenwich NICU has been empty, so it's the NICU nurses who have been doing my NSTs - they're pretty great.